The cold weather has been taking a harsh toll on my lips. They are constantly chapped, and unbearably dry. 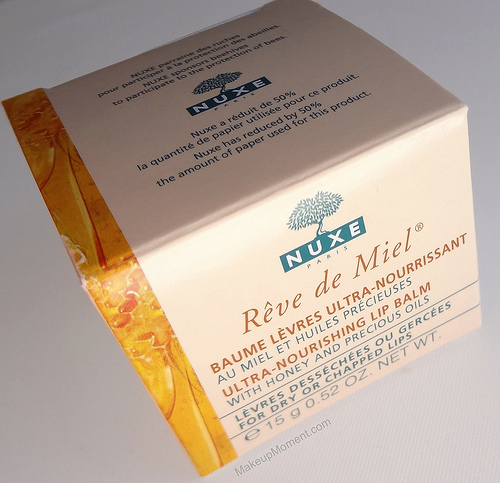 My trusty lip balms just weren't cutting it so, I decided to take the plunge and invest in a jar of the much raved about Nuxe Reve de Miel Ultra Nourishing Lip Balm ($19.00). Did I love it? Read on to find out! 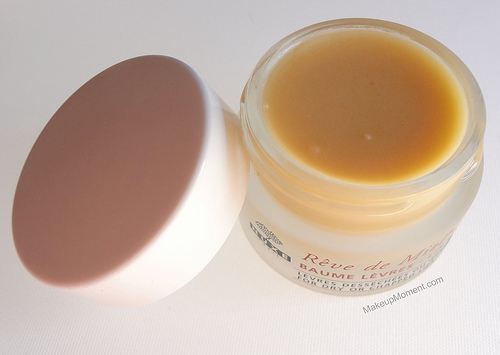 Nuxe's Reve de Miel lip balm is housed in an attarctive-and rather heavy, frosted glass jar. The packaging looks so luxe when compared to my other lip balms. Since this product contains honey, I was expecting a honey-like scent to welcome me. Imagine my surprise when I was met with a citrus fragrance instead. To be honest, I actually quite enjoy it. I don't find the fragrance to be offensive by any means, and it dissipates shortly after the balm is applied on the lips. The balm itself has a thick, and creamy texture that's very rich. Don't be fooled by the matte appearance of the balm in the jar though, because once the balm comes in contact with the warmth of your lips, it imparts a lovely, natural looking subdued sheen. Although this lip balm has it's good points like the rich texture and the delicious citrus fragrance, I don't deem this product as one that lives up to the hype. I went into this purchase with the hopes that Reve de Miel would help repair my dry and chapped lips, but unfortunately that wasn't the case. After application, my lips do in fact feel soft but the balm just sort of sits on my lips without really seeping into the skin like I hoped it would, in order to help with the repairing process. Also, I found that this lip balm grabs onto, and accentuates any flakes I may have. So annoying to deal with! I don't find this balm very long lasting so, I usually have to reapply quite often throughout the day. Overall: If your lips are in pretty good shape and you are looking for a luxurious, softening lip balm to add to your stash, this lip balm may be one to look into. But if you are looking for a balm that will help with super dry and chapped lips, I would suggest looking into something else. Maybe during the warm, summer months when my lips are less prone to chapping and drying, this lip balm may work for me. But as of right now, I don't think I am going to be repurchasing Reve de Miel, once I am done with this jar. I have been reserving this lip balm for bedtime application, as I don't want it to be left unused. I really wanted to love this product but I believe there are better and more affordable options out there that are far more effective. 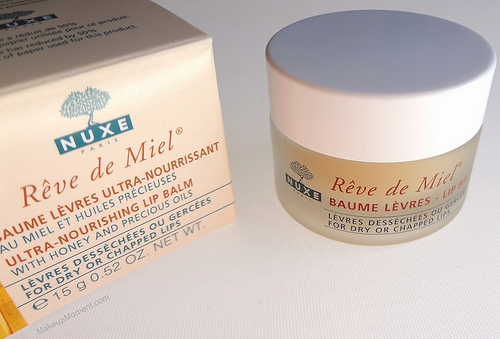 What do you all think of Nuxe's Reve de Miel Lip Balm? Which are your favorite lip balms for repairing dry and chapped lips? P.S. I am sorry that things have been a little slow on the blog, lately. Work has been keeping me mighty occupied, and December is going to be a pretty busy month for me. I will be back with more posts soon, dolls. I hope you are all doing well and Thanks for hanging in there with me! I've been in two minds about buying this. Some people absolutely rave about it and then theirs the "meh" reviews like yours. I'll probably end up trying it out anyway! I was exactly the same way, Emma Lou! Ultimately I decided to give in and purchase a jar of this. It's such a shame this lip balm wasn't what I hoped it would be in terms of performance :( This is one of those products that you either love or not. If you try it out, let me know if it works out for you. I've really been wanting to try this :) I just have an addiction to lip balm! I don't blame you. Who can resist a good lip balm? LOL! When you give this lip balm a try let me know how you like it, Aly! :) Which are your favorite lip balms for dry and chapped lips? I am always looking for new ones to try!